The first few holidays I had in India were organised by tour companies. I vaguely picked a part of the country I liked the look of or a tour that matched our available holiday dates and just turned up, generally without too much idea of what we were going to do or where we were going to go. Then after four trips where we paid over the odds for the convenience of someone else making all the arrangements, I realised that we didn’t need to do that any more. By then I knew enough about how the country ‘worked’ to just get stuck in and do it myself. I also realised I didn’t want the sanitised and buffered protection of a tour company – I we could do it ourselves and that we might well get to see a different side of life in India. For the last 5 years I have booked everything myself – flights, trains, hotels and have done all the research myself. Some of my itineraries have been pretty strange and when we meet Indian people on our travels they’re usually impressed by how much of the country we’ve seen and baffled by how I even knew about some of the places we’ve been to. I smile wisely and take all the credit but in truth most of my inspiration comes from the India guide in Dorling Kindersley’s Eyewitness Travel series. If I want a guide book to anywhere I always check first if there’s a DK Eyewitness guide available and that’s the one I’ll choose every time. Quite simply, different travellers have different needs and different people like different type of guide. DK and I are made for each other. If you want a backpacker guide that will identify every cheap dive and every cafe or restaurant that’s popular with travellers, then this isn’t the book for you. If you want lots of words and no photos, it’s also one to avoid. I actually own half a dozen India guidebooks including all the usual suspects like Rough Guide, Lonely Planet, Frommers et al but the one I actually USE and would be lost without will always be my DK guide. My choice is based on a variety of factors. I want a book that covers the whole country – even if there’s only a tiny bit about a particular place, I still want it in there. So don’t give me a guide with dozens of pages on the Taj Mahal but nothing on Hyderabad. I don’t want hotel suggestions – I will use the forums on TripAdvisor or India Mike websites to research my hotels where I can judge whether the recommendations are offered by ‘people like me’. I can also get restaurant recommendations that way though more often than not, I’m not too fussed about where I eat. I want to know about all the attractions in every city but I don’t need to know what they cost and when they are open. If I am interested enough to want to go, then I’ll go online and check for more info (and then write it onto my book). I don’t need up to date prices – I’d rather have a well researched book that offers me enough info and maybe the websites where I can go and find out more. Most of all what I DO want, is lots of pictures, lots of maps and a good sense of whether something and somewhere is really worth seeing. A guidebook with no pictures is completely pointless to me. It’s not a guide I take with me though. DK is the guide that helps me to imagine, plan and construct a tour but at more than 800 pages it’s one I leave at home. My last day tasks before I head off almost always include photocopying the relevant pages that I need before I leave. To take the whole book when you’re only going to visit a small part of this massive country would be like going bird watching with the entire Birds of the World and not just the ones you’re likely to see. Thus I often back up my DK research with a smaller, often second hand, book that’s more relevant to the particular area. Or sometimes I just go with nothing. I paid about £12 for my 2008 edition when it was still fresh off the press. Today you could get a more up to date version which was published just a few months ago. Due to the nature of India (most of the attractions have been their for hundreds of years) and to the style of guidebook (there are few prices to go out of date), I don’t feel the need to buy the latest one. Perhaps in three or four years when they update it again, I may invest in a new copy but for now I don’t think I am missing anything. Amazon can let you have a second hand copy for less than a fiver with P&P on top, of course. The first thing you notice about a DK guide is that it’s built to last. The covers are flexible but thick and have a wipe-clean surface. Both back and front covers have a ‘flap’ you can use to mark the bit you’re using, making it easier to find. Personally I use removable Post It Index Tabs to mark the bits I’m using at any time. I have had books – usually trade show guides – with multiple book marks and that would be just about the only thing I can think of that would improve the DK guides. Inside each cover there is a map – the front map divides the country into zones which correspond to particular chapters, making it much quicker to find the right part of the book without needing the index. The guideline page numbers on the map are not all correct – for example the map says Mumbai is on pages 358 to 77 but it’s not. It doesn’t actually appear until page 443. The indicated pages for Chennai and Kolkata are also wrong – I can only assume they refer to an earlier edition and were not removed or updated when this version was published. It’s not a big deal to cross them out and correct them but it is pretty weird that the publishers made such mistakes, especially since all the page indications for the other areas are correct. Once inside you’ll find a chapter introducing the country which offers a mix of highlights of each area, some maps, information on the landscape and wildlife, an introduction to architectural elements, the Hindu faith and iconography, clothing and dance of different regions. Next there’s information on the different things to see at different times of year with emphasis on the many and varied festivals. Finally you get info on the climate and the history of the country. To be honest, it’s a bit of a brain dump of things that visitors might want to know and I rarely bother too much with that section. Next we reach the main part of the guide – a set of chapters dividing up the country. Each time you get a few pages about the highlights of that region and then the key cities and sub-areas are described within that region. For example we start with Delhi and the North and get sub-chapters on Delhi itself, followed by sections on Haryana and the Punjab, Himachal Pradesh and Ladakh, Jammu and Kashmir. It’s a lot of India to chuck in together but there’s some logic to this. From Delhi, those are areas that would make some sense to visit. However, if you aren’t so familiar with the country, it could be a lot to handle in one big chapter of 95 pages. Next stop is Central India with coverage of Uttar Pradesh and Uttaranchal, Bihar and Jharkhan and then Madhya Pradesh and Chhatisgarh. Eastern India follows with Kolkata, West Bengal and Sikkim, Orissa, Assam and the Northwest. Western India offers Rajasthan and Gujerat and then Southwestern India has Mumbai, Maharashtra, Goa and Karnataka. Finally on the geographic chapters, we hit the southern tip with Chennai, Tamil Nadul, the Andaman Islands, Kerala and Andhra Pradesh. Luckily the maps at the front and back of the book should help you to navigate your way around. Finally a chapter called ‘Travellers Needs’ gives advice on where to stay and eat, where to shop, entertainment and specialist activities and then a chapter called ‘Survival Guide’ gives some practical advice on a wide range of topics from when to go, what to pack, what jabs you need, tips on etiquette and how to dress and how to stay safe. There’s also some basic advice on how to get around by air, rail and road as well as local transport. A typical city section – let’s take Delhi – starts with an introduction to what to expect, has lots of photos of the highlights, maps to help you work out where everything is and to plan how to get around, suggested walking tours with lots of photos to help you follow the route and contact details for all the attractions along with the opening days and hours and helpful hints such as whether there are toilets and left luggage facilities, cafes or audio guides. The really big attractions like the National Museum get a couple of pages with detailed layout plans and photos of the key things to see. I doubt that many people will buy this book and read it from cover to cover. I tend to leave it lying around and pick it up at odd moments and flick through for ideas. Then once I’ve decided where to fly into, the detailed work starts. What I particularly love are all the photos and pictures. It’s so much easier to find a building or a museum when you know what it’s supposed to look like. It’s also easier to plan your trip when you know which places can only be visited on particular days. 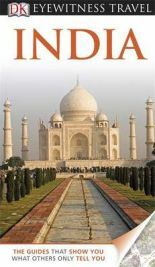 I’ve tried multiple guidebooks for India and this is the one I come back to time and time again. It won’t suit everyone and it’s not 100% perfect – the pages can get very ‘busy’ with so many things squeezed onto each page, and some of the small maps can be confusing – but the photos are spectacular and I have no expectation that any other guidebook will take the place of my DK Eyewitness guide to India. No Comments on "DK Eyewitness Travel Guide India"